Elections, Voting and Being An Informed Citizen via CHILDREN’S BOOKS | That's Greene With An "E"
Each election season we introduce Lady C to children’s books that teach her about the election process, democracy, the importance of voting and being an informed citizen. During the last presidential election we found a great gem “Grace for President”. Grace for President is the story of a young girl named Grace Campbell who realizes that there have been NO women presidents. This inspires her to run for class president against the most popular kid in the grade. She works tirelessly on her campaign to get electoral votes and in the end….. well, won’t ruin that one for you… Grab this book. It is absolutely fabulous. The children learn all about the electoral college! This year, we went back to basics and picked up a book that is not about elections per se, it’s about realizing that every person’s voice is important and every one’s participation matters… “A PERSON’S A PERSON NO MATTER HOW SMALL”. 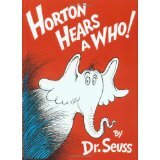 You might have guessed it… Dr. Seuss’ “Horton Hears a Who”! In this book, the citizens of the town of Whoville risk being destroyed if their voices are not heard. We see what you did there Dr. Seuss! It turns out that the littlest person in town happens to have the biggest voice and turns the tide from being destroyed to being saved. Such a great message that no matter how small you are, where you are from, what your background is – your opinion matters, your thoughts matter and your participation counts!! Do you have any books that you are reading that teach children about elections or voting or being an engaged citizen? Please share, we’d like to add to our library!